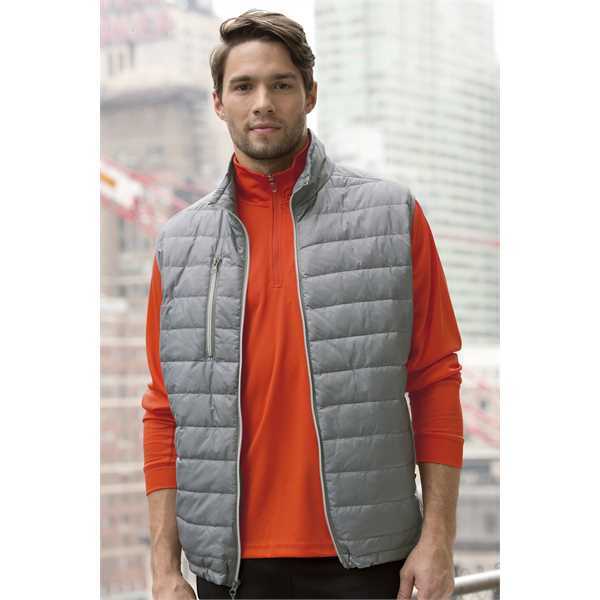 Size: 2XL, Size: 3XL - For a product that's as highly thermal as it is highly fashionable, look no further than this apex compressible quilted vest! Made from 100% polyester mini rip-stop material with a water-repellent finish, this eye-catching and cozy piece of outerwear features a stand-up collar, stretch binding at the armhole, a full-zip front with bungee/rubber pull attachment, on-seam zipper pockets, a right-chest vertical zip pocket, an open-hem bottom with elasticized drawcord and cord locks, and a Zocket™ that folds into self-pouch. Available in two colors (black onyx and grey) and in sizes from S to 3XL, it can be customized to maximize brand visibility. Imported. Price Includes: per placement. Includes garment folding and polybagging.